Recessed buttons for no "pocket false alarms". 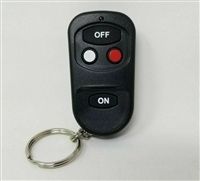 Portable device for controlling security systems remotely. 4-buttons with firm feel. On/Off. Left/Right. 4-6 year battery life on GP27A battery. GE-compatible version reports to 2nd ID. HWL-compatible version reports to Loop 4. 6+ year battery life on CR1632 battery. When magnet is pulled away from reed switch or hardwire changes to alarm. Tamper, when cover is opened.